The unhelpful weather continued as we said “à bientôt” to Mme Barratte for another year as we headed off for the opening of a new exhibition in the village hall at St Martin de Besaces. It was quite misty as we got on the motorway which was bad enough, but then, as my SatNav took us off that onto an “A” road, the mist turned to fog… which was then made worse by the fact that the road was closed due to resurfacing. Here in the UK, they do one side at a time, but for these works, they’d shut the whole motorway. Eventually, after many diversions, we arrived at St Charles… where the weather was completely clear! Fortunately, our tales of woe were supported by Tom Mountain who arrived just after us reporting the same weather problems! 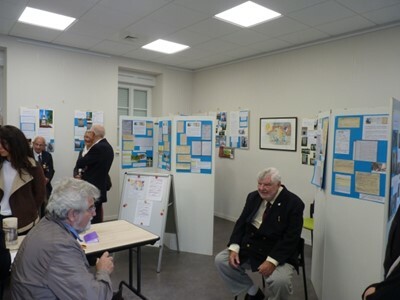 The exhibition had been created by Mme Rolande OLIVIER and Mlle Charlotte LETEINTURIER (grand-daughter of well-known local historian Michel LETEINTURIER) and was to pay tribute to those soldiers of the local community who died for France during World War One 1914 -18; we had been invited by the mayor of St Charles, M Jacques DESORMEAU-BEDOT who we had met on many occasions when we attended the 6th June commemorations at the nearby Commonwealth War Cemetery. 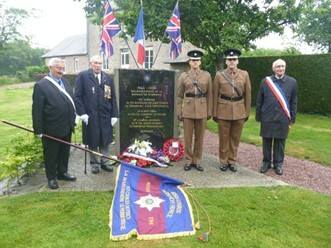 The exhibition was very well put together as a result of some excellent research work & though it was all in French, it was easy to get an impression of the impact that the First World War had had on this small village & we were pleased to have been able to visit it. Following Guards Armoured Division… backwards! Tom’s father had been part of a Sherman tank crew & Tom had tried to follow their route through the bocage from St Martin to St Charles & he’d confused the bridge over the River Souleuvre at Le Tourneur with that further downstream crossed by the British 11th Armoured Division on their way to Beny Bocage which afterwards was known as “Bull Bridge” after the charging bull insignia of that division, so, having left Gordon & Ulrike’s, we headed up to St Martin by following the rout taken by the Guards (though, of course, we would be going in the opposite direction). We passed the new memorial to another Guardsman, Hugh Dormer, but didn’t spot it until we’d passed & then on the way back, we were closely followed by a line of vehicles, so no photo this year. Once in St Martin, we decided it was time for lunch, so having called in at a boulangerie for some food, we sat under the shelter in the marketplace eating & whilst Tom tried to straighten his back as the sciatica that had plagued him all trip was, once again, playing up. 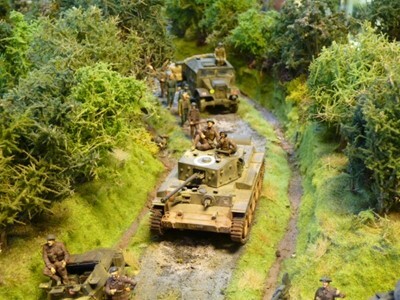 Regular readers of this blog will be well aware of the small museum at St Martin des Besaces that focuses on Operation BLUECOAT, the liberation of the village & the impact that war has on people & that was our next destination. On arrival, we were met by an elegant sight… the current President of the museum – Mark Kentell – in his traditional Scottish kilt… fortunately, it wasn’t windy, so we didn’t have to worry about an unfortunate gust of wind! However, we weren’t there just to see the museum. 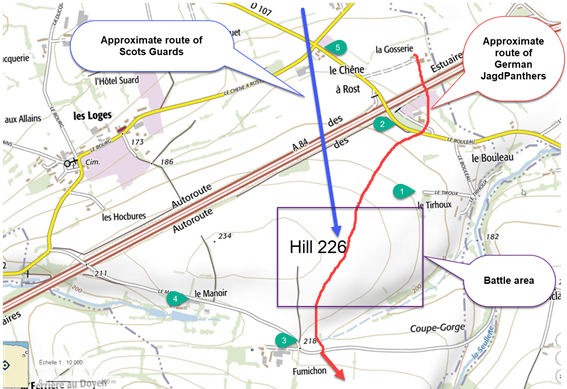 A while ago, I’d raised the possibility with Stéphane Jacquet that a memorial should be placed on Hill 226 to commemorate those men from 3rd Battalion, Scots Guards who had died on that first day of Operation BLUECOAT on their first day in action. You’ll recall that earlier this trip (as in the past couple of years), we’d visited the CWGC Cemetery at Hottot les Bagues to place memorial crosses on the graves of two of the men that had lost their lives on behalf of our friend, veteran Muir Findlay. It was through knowing Muir (& his son Eain) and researching their part in the operation that I’d come up with the idea. Fortunately, it wasn’t just an idea of madness as Stéphane had also thought it was worth pursuing & to that end, we’d arranged to meet him & the Founder of the museum, M. Jean Ménard another well-respected local historian. I’d discussed with Stéphane a number of possible sites for a memorial (and he had suggested others,) & so a convoy of vehicles set off to explore them – unfortunately, I was in the lead & only got us slightly lost! Our first stop was the holiday home of M & Mme Gauthier who live on the southern slopes of Hill 226 & who Glyn & I had met a couple of years ago. 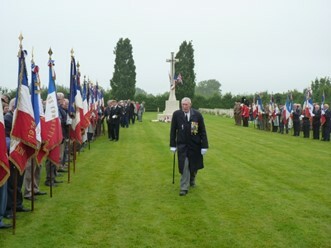 Whilst they were very pleased for their property to be considered as the location of the memorial, given that access is up a narrow trackway, the practicalities outweighed the benefits of it being able to be placed without requiring “Official Permission”. We next looked at a layby near the motorway. Whilst, in many ways, this was an ideal location – there was already space to park & it was where the German Jagdpanthers had crossed to do battle with the Churchill Tanks of the Scots Guards, it was felt that it would be difficult to obtain official permission as the layby also gave access to official vehicles onto the motorway & there could be a risk that this was blocked. Finally, we looked at a grass verge at the cross roads at the farm of Le Chêne à Rost which is where the Scots Guards Churchill tanks had driven across before deploying on the hill. M. Ménard suggested that the memorial should be at Fumichon as this afforded a better view of the hill (unfortunately, the view at the crossroads was blocked by the farm buildings) but that an Orientation table explaining what had happened be placed at the crossroads. Everyone agreed that this made a lot of sense & so Stéphane agreed to write up a proposal to put to the local authorities. 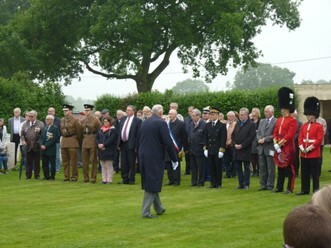 It was then back to St Charles de Percy for their Remembrance service, followed by a further short ceremony at the Irish Guards memorial & finally, a well-deserved vin d’Honneur chatting with friends. 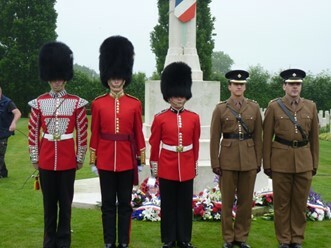 The names of the two gentlemen standing to the left of the Irish Guards Memorial were kindly provided by M Jacques DESORMEAU (Mayor of St Charles de Percy). 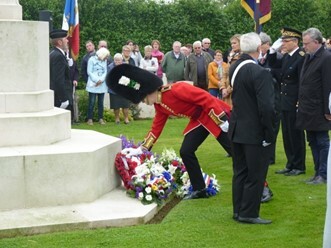 The reason for the memorial is that the Irish Guards liberated the village & so each year, following the Solemn Ceremony at the Commonwealth Cemetery, we reassemble at the memorial for a further short ceremony. 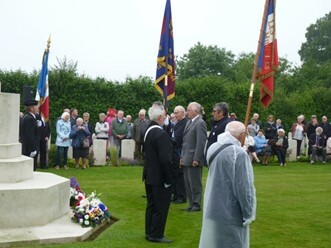 M. Robert DESBOEUFS acts as Master of Ceremonies at the cemetery & does a great job at ensuring everything runs smoothly in spite of some of the challenges that he faces on occasions – including horizontal rain & thunder on one occasion! I was also able to have long chat with M Letenturier’s granddaughter, Charlotte, who we’d met earlier in the day talking about the research that she’d done for the exhibition in the village hall & also the work that I’d done both in respect of the Scots Guards and, of course, the wealth of information that we have on the Men in the Shed project. Finally, it was back to Tony & Jill’s for food & sleep! 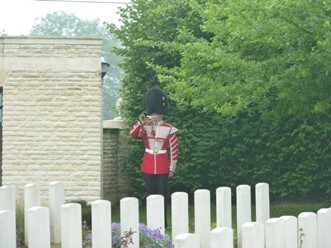 This entry was written by ColinAuthor, posted on November 28, 2018 at 1:15 pm, filed under Normandy Trips and tagged 11th Armoured Division, 3rd Battalion Scots Guards, Bull Bridge, Guards Armoured Division, Hill 226, Hottot les Bagues Cemetery, Irish Guards, Jagdpanther, Le Tourneur, M. Jean Ménard, Michel LETEINTURIER, Muir Findlay, Operation BLUECOAT, Peter Findlay, River Souleuvre, St Charles de Percy, St Martin des Besaces. Bookmark the permalink. Follow any comments here with the RSS feed for this post. Post a comment or leave a trackback: Trackback URL.